Alderley Park in Cheshire offers facilities for research & development (R&D) focused life science companies at every stage of their life-cycle, from start-up right through to becoming established as a global corporation. Whilst on site the Minister will meet with the AMR Centre, who play a key role in the British response to global threats from anti-microbial resistance (AMR), to learn about their international projects and find out about the UK’s wider trading opportunities presented by AMR. The company is a joint private-public initiative which aims to accelerate the development of new treatments and diagnostics in the fight against the growing global impact of resistance to antibiotics. "There is an ever-increasing worldwide demand for the UK’s life sciences goods and services with £33.5bn being exported last year. The AMR Centre, part of the Northern Power House, is a key part of this. It is a global centre of excellence and the work they do has the potential to save lives across the world. "Our Export Strategy aims to support their growth overseas. Indeed, we offer a range of support to businesses, large and small, which includes providing finance help through our award-winning credit agency, UK Export Finance, advice from our network of Export Champions and a wealth of resources and opportunities on GREAT.gov.uk." "It’s great to be able to showcase the internationally-important centre of excellence in the fight against drug-resistant superbugs here at the AMR Centre and with our partners across the North West. "In the UK, we have a fantastic opportunity to capitalise on our world-class universities, our drug development expertise and our global leadership on the AMR agenda to make a real difference for patients around the world." The Minister previously met with the AMR Centre on a trade mission to the Boston BIO Conference earlier this year, where businesses from across the Northern Powerhouse were able to connect with potential US buyers and like-minded firms. To expand their international profile, the company has made use of DIT support to further their overseas contacts including help and advice on attending trade shows in the likes of Germany, Japan and the US, and has already signed antibiotic development contracts with companies in the USA and Sweden. DIT is also helping wider businesses in Alderley Park with their exporting ambitions. The local International Trade Advisor, Sara Pomfret has set up regular drop in sessions on site to offer advice and support to any local business that needs it. "Science crosses borders and innovation is a powerful enabler driving the UK economy forward. 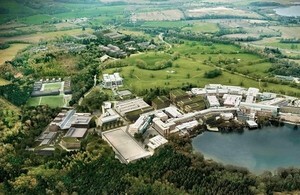 Alderley Park is a major science and technology location for UK Plc and key asset within Bruntwood SciTech, the UK’s leader in creating innovation districts. "We very much welcome the support from DIT in helping our customers take their ideas to global markets." The government recently launched a new Export Strategy which sets out how DIT will support businesses of all sizes to make the most of the opportunities presented by markets around the world. A collaboration with business, developed after extensive engagement with a range of UK firms - the Strategy sets a new ambition from government to increase exports as a proportion of UK GDP to 35%.